Fourteen senators-at-large were sworn in at the Student Government Association (SGA) meeting on Tuesday. 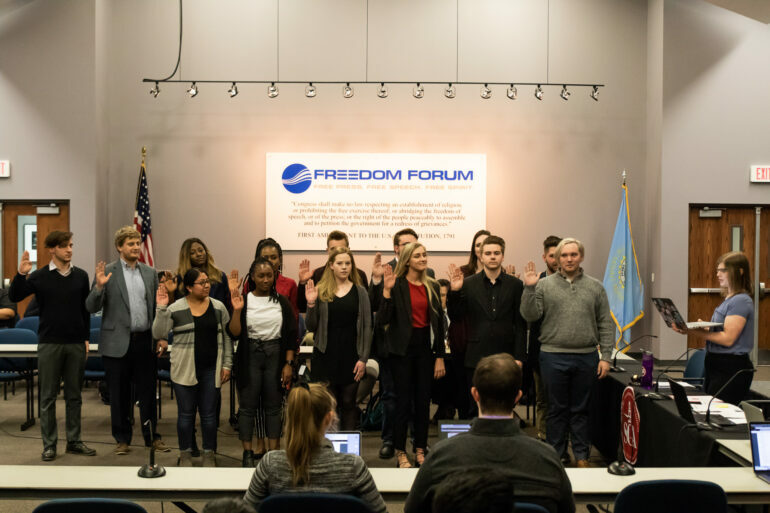 Rachael Meinders, Eleanor Rhoades, Kyle Ireland, Evelyn Dosoo, Deborah Agbeniyi, Jacob Holmberg, Ethan Walker, Matt Yetter, Abuk Jiel, Ingrid Cho, Sidney Juffer, Kevin Huizenga, Matthew Colbert and Logan Johnson were sworn in as senators-at-large. There were over 40 applicants and a list of ideas brought forth from the interviews was compiled by Sen. Kyle Sorbe for SGA to refer to for legislation inspiration. “We were really impressed with everyone’s interviews for the at-large process and a lot of really good ideas came from senators who both were elected and who weren’t elected,” Sorbe said. Senators elected through the election process represent a specific college; a senator-at-large represents the entire student body, Hannah Booth, SGA vice president said. “They have a larger pool of people that they represent, but both senators serve the same role, they just have different constituents,” Booth said. Kelsey Berger was elected president pro tempore was also nominated and elected, but not before some confusion on how the nomination process worked. Acting in place of President Carson Zubke, Booth attempted to nominate Sen. Kelsey Berger for the position before Sen. Matt Yetter pointed out Senate must nominate the candidates and then have a paper vote. Sorbe also nominated Berger, Sen. Sidney Juffer nominated Sen. Kevin Huizenga and Sen. Carissa Occhipinto nominated Yetter. In the first round of voting, Berger received 11 votes, Yetter received six and Huizenga received five. The voting then went to a run-off between Berger and Yetter, with Berger winning 13 to eight. Berger said she was qualified to be president pro tempore as she had served three terms as a senator and had been chancellor of an organization where she practiced Robert’s Rules of Order. The Tiospaye Student Council, Dakotathon and the African Student Organization all earned large organization status. Emergency resolutions to unfreeze Lambda Pi Eta, MEDLIFE and Orthopedic Interest Group’s funding were also passed. At last week’s meeting, Booth announced she would be enforcing a 30-second speaking limit. However, she has decided to instead notify senators when they have been speaking for 30 seconds so they are able to wrap up their statement.